The Giustina Gallery is located at 875 SW 26th St., Corvallis. is located in the heart of the LaSells Stewart Center and is the largest art gallery in the Willamette Valley. It proudly hosts upwards of 12 exhibits annually, featuring art of all mediums and representing local, regional, and international visual artists. 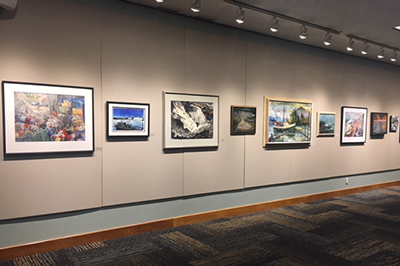 Giustina Gallery is recognized for cultivating creativity and building connections among the community and artists. 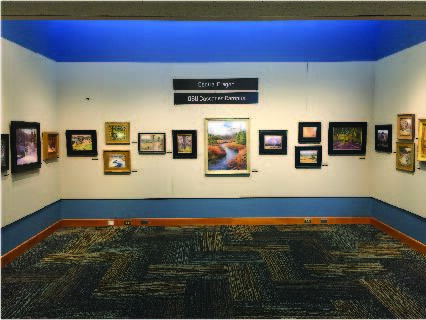 Murdock Gallery provides art enthusiasts a more intimate artwork experience—with nearly 64 linear feet of display area. South Hall Display Case features local artists in a two- and three-dimensional presentation case. Between the Giustina Gallery and the Murdock Gallery, there is a unique area where visitors walking through the galleries can glance through a glass wall and be pleasantly surprised to see flowers and shrubbery as well as a beautiful, abstract sculpture in the Myrtle Tree Alcove. This space is a great feature within the center that is commonly used to place registration tables for conferences, receptions, and school events. Collectively, the galleries provide the local and campus community diverse opportunities to view and display artwork. 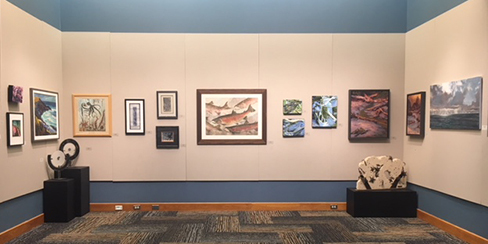 Annual exhibits include: Vista and Vineyards, Art about Agriculture, Cultural Connections Exhibit, Community Art Exhibit, and many more. Each exhibition is accompanied with a public art reception to create an engaging environment between the attendees and featured artists.